Trumpeter, Educator, Composer, and Arranger Joe Mazzaferro has been active in the Sacramento, Stockton, and Central Valley jazz scenes since 2002. His formal studies include a Bachelor’s of Music in Music Education from the University of the Pacific and a Master’s of Music in Jazz and Studio Music from the University of Tennessee, Knoxville where he served as a Graduate Teaching Assistant for the jazz program and arranged regularly for the UT Jazz Ensemble. After holding numerous adjunct positions at various academic institutions, Joe became the Coordinator of Jazz Studies at California State University Stanislaus in 2012 where he teaches various jazz courses and directs the CSU Stanislaus Jazz Ensemble. 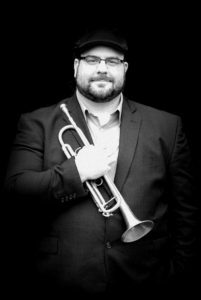 In addition to his role as Coordinator of Jazz Studies, Joe also serves as the trumpet instructor at both CSU Stanislaus and San Joaquin-Delta College and regularly teaches at Cazadero Music Camp and the Brubeck Institutes Summer Jazz Colony, and is an active member of the California Alliance for Jazz. While at the University of Tennessee, Joe studied improvisation and composition with former Art Blakey & The Jazz Messengers pianist Donald Brown, Mark Boling, and Vance Thompson. As an active freelance performer and collaborator, Joe has had the opportunity to ­­perform with many jazz greats, including Dave Brubeck, Christian McBride, Stefon Harris, Eddie Gomez, Donny McCaslin, Donald Brown, Wycliffe Gordon, Jeff Clayton, Ingrid Jensen, Lewis Nash, Montez Coleman, and Jim Snidero. In recent performance opportunities, Joe has had the privilege of performing the Miles Davis masterpiece Birth of the Cool with Gunther Schuller at the 2013 Brubeck Festival and was a part of the series “Remembering James Williams & Mulgrew Miller” with pianist Donald Brown’s Quartet at the 58th Annual Monterey Jazz Festival. Joe also performs regularly at Take 5 Jazz Club in Stockton and currently serves as the Musical Director and Co-Founder of the Sacramento Jazz Orchestra. Joe has gained critical acclaim as a composer and arranger. His works have been performed by many prominent jazz musicians which such as Ingrid Jensen, Claudia Villela, Dave Pietro, and Patrick Langham as well as the Sacramento Jazz Orchestra, University of Tennessee Jazz Ensemble, and the Tommy Igoe Big Band. Two of his latest compositions “Song For Fizz” and “Dark Heartbeat” will be featured on alto saxophonist Patrick Langham’s forthcoming album East to West due out in December 2014. The Sacramento Jazz Coop presents the Joe Mazzaferro Quintet playing the music of legendary Cannonball Adderly, on March 26, 2018 at 7 PM Antiquite, 2114 P Street, Sacramento. Tickets at eventbrite.com. Joe is joined by Patrick Lanham on Alto, Brenden Lowe on piano, Ben Kopf on bass, and Brian Kendrick on drums.